Reimen Dining TSURUSHIKO is a restaurant near Shibuya Station that specializes in Tokyo Reimen. Reimen is a Korean inspired noodle dish that is usually served cold. TSURUSHIKO offers delicious, healthy noodle dishes as well as many vegan options. Reimen is a dish that originates in Korea. It usually consists of a light, slightly spicy soup and chewy noodles made of flour and starch. Reimen is mainly served cold. It is usually served in other restaurants with Korean roots such as yakiniku restaurants. We will introduce you to REIMEN DINING TSURUSHIKO, a restaurant close to Shibuya Station which specializes in Tokyo Reimen, which is actually unique to this dining place. Tokyo Reimen is a new type of dish inspired by traditional reimen. Mr. Choshi, the chef of TSURUSHIKO, is from Iwate Prefecture. One of Iwate's local specialties is a reimen dish called Morioka Reimen. It is a special kind of reimen made with beef broth and topped with beef, vegetables, eggs and a slice of watermelon. Tokyo Reimen takes many ideas from other popular dishes such as Italian cuisine and curry and creates a completely new dish. Mr. Choshi has learned about macrobiotic eating for about two years while working with Foods Lab, the company which owns TSURUSHIKO. His concept is to create food that is not only good for your body but also delicious. He wants people to enjoy healthy dishes together and leave satisfied no matter if they are foodies, health conscious or vegan. The noodles are made with spring water and wheat from Iwate and potato starch from Hokkaido, an area famous for their delicious potatoes. Most of the fresh ingredients are delivered from Iwate on a daily basis as well. The base of the soup is extracted from fresh vegetables by simmering them for a long time on low heat. If you order one of the creamy soups, it is made with soymilk instead of regular milk. Mr. Choshi decided to offer a primarily vegan menu with a small variety of non-vegan dishes to cater to overseas visitors, who tend to have more specific dietary wishes and needs. You can also order a vegan dish and add meat or eggs if you don't want to eat vegan only. Sometimes when you visit restaurants that are advertised as healthy or vegan, the portion size can be on the small side. However, TSURUSHIKO is no such restaurant. The prices and portions are comparable to a usual bowl of ramen making it an affordable, healthy and satisfying lunch or dinner option. Mr. Choshi believes that it is very easy for people to switch to a healthier diet if you make it as delicious and satisfying as the less healthy option. This is also the reason why he doesn't offer any gluten-free dishes yet. He just hasn't achieved a delicious, gluten-free reimen dish up to his high standards until now but he is working on it. TSURUSHIKO mainly offers a variety of cold noodle dishes but they do offer hot reimen, known as onmen. Most onmen are just available in winter (between October and March) but a small selection stays year round. We asked Mr. Choshi for the most popular reimen at his restaurant. Being from Iwate, Mr. Choshi is especially proud of his Morioka Reimen. Thick, handmade beef broth covers the chewy handmade noodles. Thinly sliced beef, vegetables, and kimchi serve as topping. This dish is served cold. The Vegetable Curry Reimen is vegan and loved by the customers of TSURUSHIKO. Many people come here especially for this dish. The base is a thick vegetable and soy milk broth topped with plenty of steamed vegetables. It is seasoned with just enough oriental spices to be not too spicy and not too mild. The vegetable curry reimen is available in a cold or hot version. However, as of now, the hot version is only available during the winter months. Vegetable, Tomato, and Basil Reimen, inspired by Italian cuisine, are some of the most outstanding items on TSURUSHIKO's menu. This particular dish features dried and fresh tomatoes topped with fresh basil. The rich vegetable soy milk soup makes a perfect base for this fragrant dish. The dish is vegan but feel free to add some extra cheese to give it an even richer taste. Please note that the cheese topping is only available during the winter months. This is another dish available in hot and cold versions. If you love avocado, you need to try the Vegetable and Avocado Reimen. This dish is vegan and only available as cold noodles. It is made with the same rich vegetable soy milk base as many of their other dishes. Tomatoes, onions, basil and of avocado, sliced and as guacamole are used as toppings. Everything is held up for a beautiful display by a big slice of fresh lotus root. The cream on top is made with soymilk, miso, and secret spices. It tastes like the most flavorful sour cream. You'll never taste the typical soy milk flavor in any of TSURUSHIKO's dishes. It just tastes creamy and delicious. The chewy noodles have a unique texture between rice noodles and ramen noodles. They are refreshing and filling at the same time. Mr. Choshi recommended trying the reimen in different stages. 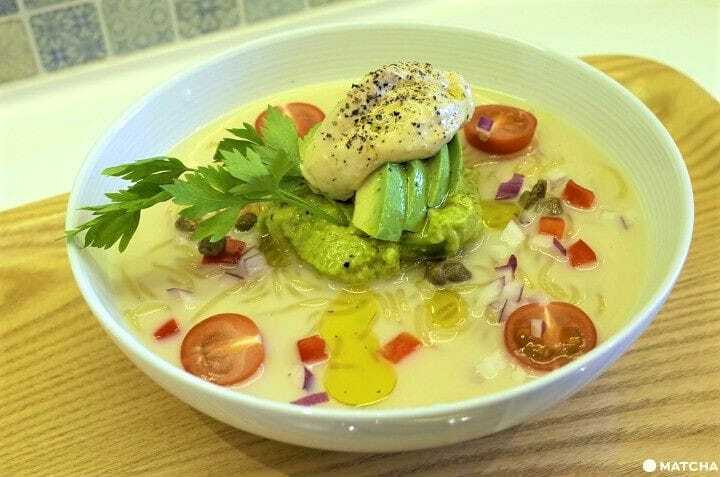 First the soup and noodles together by themselves, then with either the cream or the guacamole and lastly all together. Each way provides you with a different flavor experience. As side dish, we choose the popular soy karaage, or in short soy kara. This is also a vegan dish made with bean curd battered and deep fried in vegetable oil. It is topped with a spicy miso paste. The soy karaage is crunchy and delicious and has a very chicken-like texture. The miso topping is not too spicy and offers a rich flavor. This side dish is a nice option for every vegetarian or vegan to try one of Japans most popular comfort foods in a meatless version. Another recommended side menu is the steamed or grilled fresh vegetable dish. The grilled version comes with a healthy tofu dipping sauce. Like at most ramen shops you have to buy an order ticket at the ticket machine. TSURUSHIKO has a multilingual ticket machine with English and Japanese display. It even has a vegan button to sort all the vegan dishes for you and make ordering as simple as possible. Tokyo Reimen could be seen as the lighter and healthier version of ramen. However, it is just as delicious as high-quality ramen, if not even more flavorful. If you still prefer ramen, in the winter months, they also offer the popular Japanese dish. However, as most of their dishes are served cold, Reimen Dining TSURUSHIKO is the perfect choice for the upcoming hotter months. Why not try delicious Tokyo Reimen which is even good for you?